PAN Linked with AADHAAR or not? Check Status. 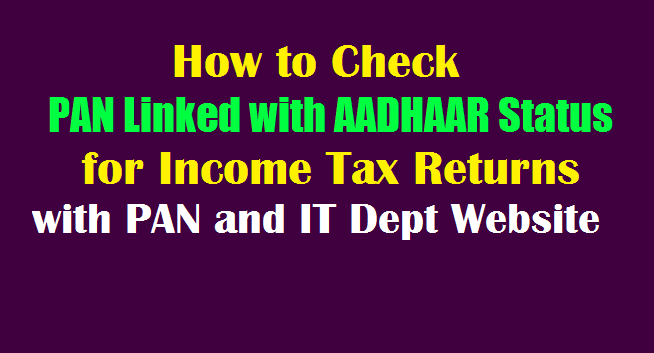 How to Check Status / Link AADHAAR for Income Tax Returns with PAN and IT Dept Website Yesterday Supreme court of Indida has ordered that its compulsary to link AADHAAR with PAN number for Income Tax Returns filing. Check here wheather your AADHAAR linked with PAN or not. Now it is mandatory to link up your AADHAAR number with Income Tax Department website and as well as your PAN Number. Know here How to Link AADHAAR with PAN and Income Tax eFiling website.